The Racah Institute of Physics was named so after Prof. Giulio (Yoel) Racah (1909-1965). In 1939 Racah settled in Jerusalem, after having already been appointed a professor at Pisa, and having worked with great physicists Fermi and Pauli. 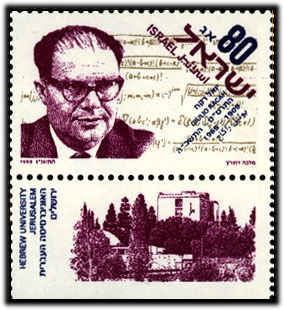 Racah is considered as one of the founding fathers of physics in Israel. Besides being a brilliant physicist, he was also a member in the Hagana, the Dean of the Faculty of Sciences (1946-1948), won the Israel Prize (1958), and served as the Rector and acting President of the Hebrew University (1961-1965). He died prematurely in an accident, at his birth town of Florence (1965). In 1970, the Racah Institute of Physics was formally established and named after Giulio Racah. The Racah Crater on the Moon was named after him. You are invited to visit our online museum of Prof. Racah. Today, the Racah Institute houses a first rate physics research covering a wide range of physics disciplines from nanophysics, biophysics, nonlinear and condensed matter physics to few body systems, nuclear & hadronic physics, high energy physics and astrophysics. It also caters a large body of students at all levels, from a high level undergraduate curriculum to advanced graduate degrees, as can be attested by a Racah Institute of Physics graduate and Nobel laureate, Prof. David Gross.